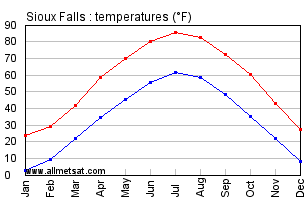 Sioux Falls, South Dakota is located in the CDT (Central Day Time) time zone, UTC/GMT -5 hours during Daylight Saving Time and UTC/GMT -6 hours during Standard Time. The sunrise is at 06:41 and the sunset at 20:15 for the moment of the end of August 2018. The length of the day is 13 hours 33 minutes. The time in Greenwich, London is 6 hours ahead of Sioux Falls, South Dakota. Sioux Falls, South Dakota is located in the area of the Humid Continental Climate with hot, humid summers and cold, dry winters. That type of climate explains large seasonal temperature differences. The precipitation is equally distributed; the precipitation might be reduced during the winter time. However, the rainfall is usually replaced with the snowfall during those months. 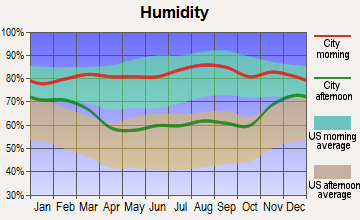 Most summer rainfalls are connected with the occasional thunderstorms and a tropical system; however, that does not necessarily affect the humidity level of the territory. The average temperature reaches about -8.6 °C (16.6 °F) in January and about 22.8 °C (73.0 °F) in July. There are approximately 18 days in a year when the temperature exceeds 32 °C (90 °F) and about 26 days when the temperature is below -18 °C (0 °F). The highest temperature recorded in the history of Sonoma County was 43 °C (110 °F) on June 21, 1988, the lowest temperature was filed on February 9, 1899, when it reached -41 °C (-42 °F). The number of sunny days per year reaches about 211 days. The UV index in July is about 9, while in January and December it falls to 1. The annual rainfall level is 685.8 millimeters (27 inches). June is the wettest month of the year when the average rate of the precipitation is 3.5 inches and rain lasting from 12 to 13 days per month. Notably, May is considered as another wet month as the storm sometimes lasts 13 to 14 days per month with the average rate of the precipitation of about 3.4 inches. The driest month of the year is December with the average level of the precipitation is 0.6 inches and rain lasting from 3 to 4 days per month. In January the precipitation level reaches about 1.0 inches, and the storm continues for about 2 to 3 days per month. Snowfall occurs during the winter usually with 113 centimeters (44.6 inches) of snow. March is considered as the snowiest month of the year with 21.3 centimeters (8.4 inches) of snow. The Average Humidity Level reaches 69%.